Scientists of the Hubble project showed a fantastic image of galactic clusters. The galaxies are rather randomly distributed in space. Some live alone, others swarm hundreds of them together, interacting with each other with the forces of gravity. For example, our own native Milky Way galaxy is a member of the Local Group, which in turn is part of the Virgin Group, which in turn is part of 100,000 galaxies of the giant super cluster Laniakea. 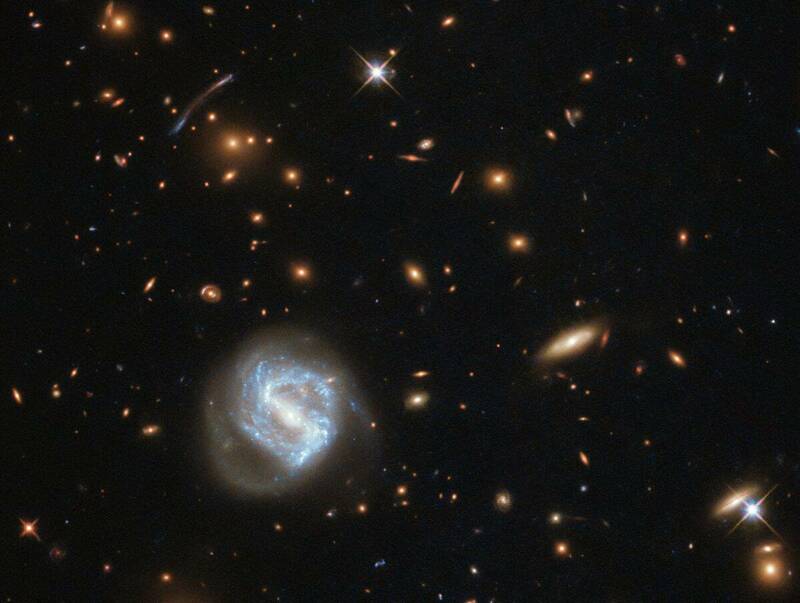 The cluster of galaxies, which is presented in this photo, is known under the designation SDSS J0333 + 0651. Such galactic groups can help astronomers understand how our universe was born and formed, as well as all its inhabitants. The galaxy cluster SDSS J0333 + 0651 was photographed in studies of stellar formation in extensive galaxies. As a rule, star-forming regions are not very large and extend in outer space only a few hundred light-years. However, it is very difficult for telescopes to determine the exact distance of star forming regions in galaxies. To facilitate this task, astronomers use galactic clusters with powerful gravity that warps space and time and creates a so-called lens that helps to know the more accurate distances of these regions.